and the telephone rings and you hope it is not for you! On Friday nights, when I was a young man, I'd head across the river to a night of square dancing at the Round House. Always short on money and long on ambition, I was on the lookout for a pretty partner, dance and otherwise. A senior in high school, class of 1948, I drove an old 1937 Packard with the fenders coming off. Not exactly a turn on for the girls, I loved that old packard. Now that I am older and wiser, and drive a Lincoln Town Car, a pretty girl called me and invited me out on a Friday night date. It was my wife, Julie, and I was quick to say "Yes". She had a $15 gift card for the Olive Garden and that was the best offer I'd had all week. "Se no e' zuppe, e' pan bagnato"
"I am not breaking up with you, I am taking a pause"
"If it's not soup, it's dipped bread"
Julie and I like the Olive Garden. It is a nice place to eat, the food is very good and the prices are within reason. We often entertain at home or at a weekend retreat serving carry-out from Olive Garden. We will make our own salad and allow our guests to choose their entree. Our waitress was aptly named "Tina". She was both pretty and petite. When she described the wine of the day she poured each of us a generous sample. She took our drink order, coffee for me and water for both of us. She checked but allowed us ample time to decide what we wanted. Julie ordered for me getting us both soup and salad. Service on a night out is about as important as the food and drink. Tina couldn't have been better. Julie and I had more food than we could eat. Tina carefully bagged our uneaten food. We have salad and entree enough for another complete meal. The bill was $47 and I left a $7 tip for a total cost of $54. With two meals today and two meals tomorrow, that works out to be only $13 a meal, less a $15 gift certificate.Not Bad! Oh, Yes! Tina gave us each a mint. I don't eat mints because of the sugar but our housekeeper, Donna, loves them. Retired for over 20 years now, I am thankful that we can still enjoy living the good life. I am also thankful that at last I've found a pretty Friday night date. Un Huh! I LOVE LVE LOVE your blog. Your date night beat Mary Kay and me. We stayed in last night. Today is moving day for Jessica! Big day! I'm so pleased you read and enjoy my blog. You are my mentor! At home alone with a pretty girl like Mary Kay? Trust me son, it doesn't get any better than that. You are very blessed to have that 'girl' for a lifetime of Friday night dates! She's a keeper! P.S. 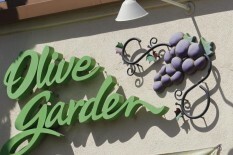 I do love Olive Garden. We made two trips recently to celebrate our birthdays.